Who’ll Bell be backing in the Bedford by-election? Could his intervention thwart the Tories? Probably the biggest election, certainly in terms of the number of voters involved, in the UK before the general election takes place in Bedford in October when there’s a by-election for the post of elected mayor. This follows the death a fortnight ago of the union activist turned multi-millionaire media entrepreneur, Frank Branston, who had held the position since it was created six years ago. What’s interesting is that he was an independent who had built up a group of independent councillors some of whom who were given by Martin Bell endorsements in the June 4th council elections. The man in the white suit allowed his picture and his backing to feature strongly in the campaign and the question arises over whether there’ll be a Bell endorsement in the mayoral race. After all a hold by an independent would give momentum to the movement he seems to be trying to get going. The borough covers the whole of the Labour ultra-marginal of Bedford as well as parts of solid blue mid-Beds and and NE Beds Westminster seats. This is an election the Tories really have to win in the run-up to the general election – yet in June they had their poorest local results in the country there. At the same time the Lib Dems had their best performance anywhere and a good result in the mayoral race would be a boost for the party after the run of Westminster by election disappointments. But could an independent with Martin Bell’s backing upset the apple-cart?. Just trying to keep up with the Scottish polls on Megrahi is getting to be quite difficult and there has been another one overnight – by MORI for the Reuters news agency. This found that 40% of Scots were in favour of the decision with 47% opposed – so numbers that are more sympathetic to the SNP position than the ICM poll reported earlier. It’s hard to compare one poll with another because both asked very different questions and both provided a different range of possible answers. MORI was more nuanced. Thus it found that 37% said they â€œstrongly disagreedâ€ with the decision to free Megrahi, while a further 10 percent â€œtended to disagreeâ€. But that was almost balanced by 19 percent who â€œstrongly agreedâ€ with 21 percent who â€œtended to agreeâ€. A key difference might, however, have been timing. Almost all the fieldwork for this poll was completed before work on the ICM poll started. A Westminster voting intention poll in the Telegraph? There is a suggestion that there might be a poll in a picture of the paper’s front page that has been shown on Sky News – but nothing so far on the paper’s website. Maybe the plan is to try to sell more copies of the printed edition and who can blame them? Only a few days ago I was bemoaning the fact that there did not seem to be any polls of Scottish opinion on the release of Megrahi – the man convicted of the Lockerbie bombing and murder of 270 people. Well this evening we have a second with strong suggestions that there might be another one this weekend. The survey is by ICM for the BBC and is of 1,005 people in Scotland. If this has followed the normal pattern for BBC-commissioned polls then the sample would not have been past vote weighted and will probably have had a pro-Labour bias. In the panel above are the main views of those interviewed showing 60% saying the Scottish government was wrong against 32% saying it was right. A total of 68% thought the decision was influenced by factors other than Megrahi’s health, while only 20% believed it was made purely on compassionate grounds. But on the national scene the poll also asked about Gordon Brown’s handling of the affair. A total of 67% of the sample thought the PM’s reputation had been damaged a little or a lot. Only 29% thought that Brown had not been damaged. It is important to underline that the other two polls – the one for YouGov and the other by Angus Reid – had politically balanced samples. This one, I believe, didn’t. One day the BBC will join the modern polling world – or will it? How much are tax-payers funding political parties already? 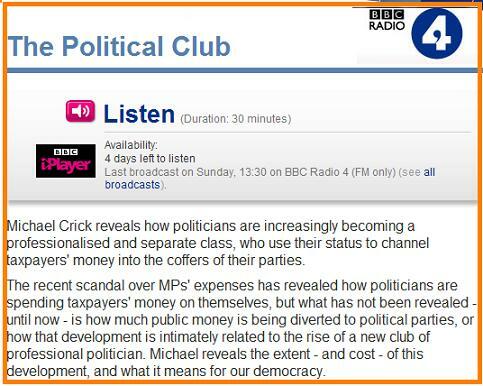 I’ve just picked up on BBC IPlayer this great Radio 4 investigation by Michael Crick on the funding of political parties and the rise of what he calls “The Political Club”. The programme blurb goes: “Michael Crick reveals how politicians are increasingly becoming a professionalised and separate class, who use their status to channel taxpayers’ money into the coffers of their parties. Crick looks at how things like the way the massive increase in thing like councillors’ expenses and allowances in the past decade has led to large sums being channelled into the party machines and what EU election victories for UKIP and the BNP mean for their campaigning machines. Until the late 1980s councillors just got travel and subsistence expenses and could claim for more if could show that they were losing wages because of their council duties – why not return to that? Compensation for loss of earnings rather than an income stream in it itself. What’s striking is that the amount public funds going to councillors seems to have increased in inverse proportion to their actual powers. Virtually al the big decisions these days are taken elsewhere yet they are voting themselves big piles of cash. For those not holding council cabinet jobs their roles have been even more marginalised. This programme raises a lot of issues. There are only two days left to listen. Will 2010 be the year of “Double Tactical Unwind”? Could the tactical switchers of ’97 now go straight to the Tories? One of aspects of the electorate that both the YouGov Scottish poll and this week’s GB survey from Angus-Reid have shown is the very distinctive approach to the Lockerbie bomber release by Lib Dem voters. This is symptomatic I believe of their approach to politics generally and why what they think and do at elections can have a disproportionate impact at general elections. We saw that in 1997 when in Labour targets they were ready to “lend their support” to Tony Blair’s party to help oust the Tories. In 2001 they seemed even more motivated to keep the Tories out and through their actions in seats that Labour had taken four years earlier helped Tony Blair to retain almost all of his majority even though his vote share and vote total was down. By the last election in 2005 it was a different story. In the aftermath of the Iraq War the big shift was a six point reduction in the Labour share and Labour lost seats not because of moves to Michael Howard’s Tories but because the Lib Dem tactical voters of the previous two elections had gone back home. The move was dubbed as “tactical unwind”. Given current polling I wonder whether in key seats we will see many of these voters go to the Tories in those key constituencies where such moves matter. Quite simply will we get “Double Tactical Unwind”. The signs are there that something big is happening with this segment of the electorate. 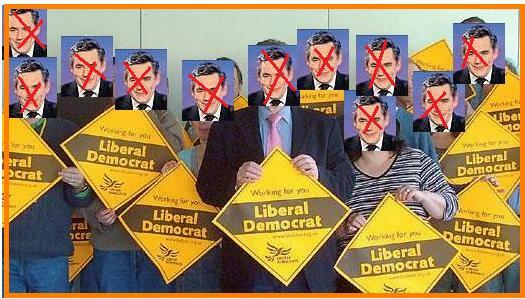 Back in August 2007 YouGov found that Lib Dem supporters split by 60% -to 23% in favour of Labour when asked “If you had to choose, which would you prefer to see after the next election, a Conservative government led by David Cameron or a Labour government led by Gordon Brown?”. These voters are now given the Tories a significant lead. This was backed up this week in the ICM poll when voters were asked, whether a Tory government under David Cameron, or a Labour one under Gordon Brown, would be best for Britain. A total of 56% of Lib Dems voters said they would rather see the Tories in power, against 36% who want Labour. The critical thing here is what these voters do in specific seats when they are fully appraised of local electoral situations. If enough of them vote tactically for the Tories then Labour will suffer disproportionate losses on top of the swing predictions. This is why the battle for the centre ground is paramount and why the biggest danger to Cameron is if he is seen to be giving ground to his right wing. Please note: I’m en route to Glasgow staying in a part of Cumbria which appears to be a total Vodafone black-spot. I have almost no reception or any other internet access. This post, as they say, was “prepared earlier. Can Brown take hope from Major in 1992? Could the polls be as wrong now as they were then? If there is one precedent that could provide some hope for Brown Central it is John Major’s surprise victory in the general election of April 9th 1992. In the year or so beforehand the Tory government’s by-election performance was even worse than Labour’s at the moment and with the exception of one or two polls all the pollsters were pointing to a dead heat in vote numbers as the best Tory outcome. Yet come election day John Major’s party came in with a vote margin of more than seven percent above what Labour achieved and won their fourth successive election victory. The main difference between now and then was that the Tories never dropped out of the 30s – and, of course, all the polls were un-reformed and there was a systemic bias towards Labour. Also in terms of political skill and appeal my judgement is that David Cameron is miles ahead of Neil Kinnock. Please note: I’m staying in a part of the Lake District which appears to be a total Vodafone black-spot. I have no reception or any other internet access. This post, as they say, has been “prepared earlier. Does this mean that Mandy is now out of the race? What’s the story behind this change? All the speculation that Peter Mandelson might be thinking of running for the Labour leadership was sparked off by the planned changes in the law to allow life peers to resign and so stand for election to the commons. Today’s news mean that this is now not possible. I would love to know that the story is behind this change. Opinion polls confined to just Scotland are rare things indeed and according to UKPollingReport there have only been two this year – one by YouGov for the Sunday Times last January. UPDATE – the last Scottish YouGov poll was in June. This morning the Daily Mail is carrying details of a new YouGov Scottish poll it commissioned following last week’s controversial release of Megrahi – the man convicted for the Lockerbie bombing. On voting intention for the constituency element of the Holyrood parliament the poll shows the following with changes on the January June survey by the pollster: SNP 33 (-5): LAB 31 (-1): CON 16 (+3): LD 16 (+4). SNP 33 (-6): LAB 31 (+5): CON 16 (+2): LD 16 (+2). Given the long time gap between the two YouGov polls it’s hard to conclude that the decline in the SNP’s share was down to Megrahi’s release. The Tory share is the highest that’s recorded from the pollster on the UKPollingReport table which goes back to the 2005 general election. A Westminster voting intention was asked but the only figure I can find is the SNP on 25% which is down two on the January survey. To the question “Do you think releasing Abdelbasset al â€“Megrahi was the right or wrong decision to make?” the sample split Right 42%, Wrong 51%. Like in the Angus-Reid GB poll reported here on Tuesday Lib Dem voters were much more likely to be supportive of the SNP-led government with 57% saying it was right. With Labour voters the proportion was 39% with Tories it was 30%. Just 28% of those who took part backed Scottish independence. The Mail report says that this figure is down 8 points during the year but I have been unable to find that earlier poll. Before the last Scottish elections in 2007 YouGov reported that 42% were in favour.